The Drina tract and the region of Jadar – the northwestern Serbia – are rich with mineral and curing water springs. One of the most precious balneological treasures, not only of this region but of the whole of Serbia, is the Spa of Koviljaca. Hidden in the greenery of one of the most spacious and beautiful parks in Serbia, the Spa is situated on the right-hand side of the lower flow of the Drina, at the foot of the Mount of Gucevo (779 m). 6 km away from Loznica, 80 km from Valjevo and 144 km from Belgrade. There are several springs of sulphureous (19° -28° C) and ferrous (14° – 15° C) water springs in Koviljaca Spa used for medical purposes by bathing, drinking and spraying. The sulphureous bath mud is also used – made in special pools where it is kept for 2 – 3 years. The ferrous water is radioactive (5.9 – 6.8 MU). The Spa waters are favourable in curing bone injuries, neurological and muscle diseases… There are many legends regarding the origin of the Spa, but it can be argued with certainty that local people have been familiar with its mineral waters since ancient times. Archeological finds point to the stay of Ancient Romans in the area – the Genesis settlement – while the remnants of towns-fortifications in the vicinity speak that the sulphureous waters of the lake that had developed there between the foot of Gucevo and the Drina, were used in medieval times. Due to the characteristic smell of the waters, and as noted in the works of travel writers who visited the area at the beginning of the 19th century, the lake used to be called Smrdan (smelly), so that the first name of the Spa used to e the Smrdan Spa. Although Koviljaca was mentioned in 1533 as a village in Bohorin administrative region of the time, it had been neglected till the second half of the 17th century, when the Turks started paying greater attention to it: they gathered around the wells, entertained themselves and rested. At the beginning of the 19th century, there were no arrayed baths there, but Koviljaca was already included among the known natural sanatoriums, as testified by Vuk Karadzic in his notes dated 1827. 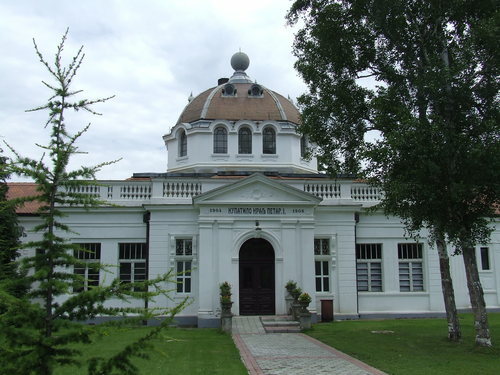 Considerable attention was paid to Koviljaca Spa after liberation from the Turkish rule, but the first chemical analysis of the waters taken from the four major springs was made as late as 1855. Only three years later, the first accommodation facility “with ten rooms was raised together with a building used as “general kitchen”. In the same year, the sanatorium gained its first seasonal spa doctor. All that contributed to a more intensive building of the Spa settlement, so that in the seventies of the 19th century Koviljaca was included among the major spas in Serbia. (These waters were tested in Vienna in 1862 by the famous balneologist Dr. Lindermeier who assessed highly their healing cities. The analyses taken later confirmed the exceptional curing effects of rre -phureous waters, ranking them as high as the most famous similar spas in Europe. August 1st, 1898 is considered the beginning of organized development of the Spa, when it was rendered to the ‘people of the Drina region by the decree of King Aleksandar I Obrenovic. Further progress of Koviljaca as a natural sanatorium is connected to the role of King Petar I Karadjordjevic – no himself had been treated in it, and in 1904 decided that a modern European, looking spa should be raised there, where the border with Austro-Hungar. then was. In the first years of the 20th century, a few new springs of sulphureous water were opened, Gvozdjevito (ferrous) and Mesovito (mixed Barns were opened, as well as cold springs and those of ferrous water for drinking. In 1907, a new hot Sumporovito (sulphureous) Bath was opened and it is still in use today.. In those years, about sixty private villas and houses were available to the guests – “two private inns with rooms, 8 houses and villas of the first class and another fifty of the second”. As early as 1911, Koviljaca was considered as one of the “best landscaped and most frequented spas in Serbia“, famous also by its successful treatment of children’s illnesses. Another intensive construction of the Koviljaca Spa was in the perioc from 1920 to 1930. Hercegovina and Dalmacija villas were built (1928 -a terrace connecting them, and then a few sanatorirums and social care es lishments, very modern for that time. The unique architectural edifice or C Saloon shone in its full beauty in 1934, and then Jadar, Beograd Hore.s Srbija Hotel – the largest children’s sanatorium in former Yugoslavia . Almost a century and a half upon its origination, the Koviljaca Spa is one of the most important and most frequented balneological centres in Serbia. “Banja Koviljaca” Special Hospital for Rehabilitation has been, under various names, the promoter of the Spas development. This Institute is known for its Children’s Ward – 80 beds – arranged in cooperation with the Children’s Surgical Clinic of the Clinical Centre in Belgrade. Modem diagnostic and therapeutic facilities, expert medical staff – more than 220 medical specialists and other personnel – give this Spa special importance among the balneological centres in Serbia. Although Koviljaca Spa is situated in lowland – only 125 m of altitude – the forest expanses of Gucevo and vicinity of the Drina have made the Koviljaca Spa a famous climatic location. The temperatures of transient seasons – autumn and spring – are steady, and the temperately humid climate in the tourist season is very convenient for the nervous system and soothing for the respiratory organs. The village of Trsic. the native place of Vuk Karadzic, is today a unique ethno-park (since 1933. 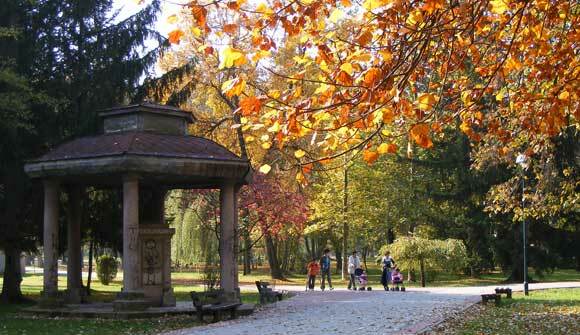 Vuk Karadzic Festival, one of the most important cultural performances in Serbia, has been held here in autumn). It is 14 km away from the Spa, while the Tronosa Monastery (16th century) is just 2 km away. The vicinity of the Drina enables fishing and bathing on the arrangec beach. Strolls can be taken not only in the beautiful park, but also along the paths of health and towards Gucevo, or a picnic can be made to Lake Zvornicko.